Yesterday and today i had the privilage to attend the 2nd International Conference on Islamic Spirituality on the theme of Journey to Ihsan. i must confess that in this particular conference i have had the chance to come across some of the most brilliant scholars and spiritual personality of our time. during the events my heart melted, at times my eyes were moist and i was overwhelmed with the words and the profound message. so was other audience i am sure. let me just briefly tell about the prominent speakers who spoke in the conference for the 2 days and later i will be posting from their lectures and sharings. i never had the chance of meeting a great Sufi Masters face to face to hear directly from. Thanks to God that i had the chance when Master Hisham Kabbani spoke in the conference. He is an eminent mainstream islamic scholar who can speak right to your heart. i never heard such charismatic lecture that he delivered. he will speak about the glory of God and you will just cry from your heart. Shaykh (meaning Master) Muhammad Hisham Kabbani is based in USA. so if you happen to get a chance to listen to him, pls do. its a blessings to be able to see and listen to a personality like him. another very spiritually gifted personality that i have ever seen. academically very talented (masters education from Michigan University, Research Fellow at Cambridge University) and also she is a great contributor in publishing in the area of Islamic studies and comparative religion. in our times when u come across a teacher who has internalized what he teaches and speaks about, u will immediately can understand. this is because its a rare gift. when one hears from this professor in the dept of religion at University of Georgia, one can immediately see that quality in him. this is another personality who makes his audience cry just by speaking about simple things like gratitude to God. academically one of the most brilliant, awarded National Endowment to the Humanities Fellowship, Fullbright-Hayes Fellowship and more, Professor Alan Godlas also is the author of world wide web's most comprehensive site on Islam and Sufism (webby award nominees for spirituality category. from the University of Virginia, professor Gianotti is a gifted soul. author of the book Al-Ghazali's Unspokable Doctrines of the Soul, a study of controversies surrounding the Soul and the afterlife in medieval Islam. when he speaks, he speaks with such brilliance that you can't help but admire his articulation, personality and the wisdom behind it all. there were other speakers in the conference, but these four speakers really took my breath away, and i must thank them for sharing the ocean of wisdom with all of the people that were present in the conference. 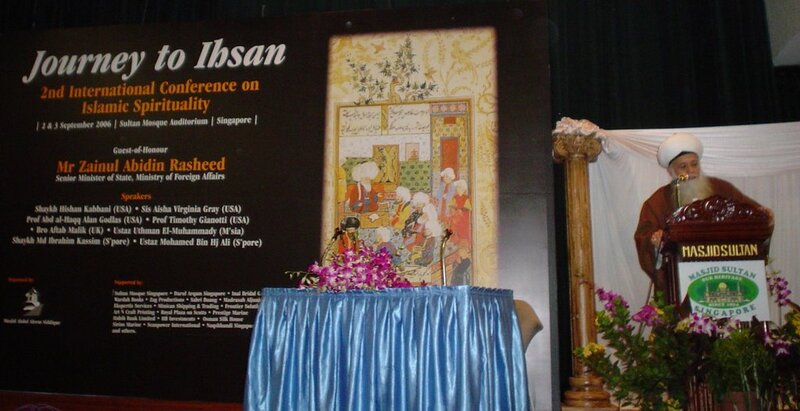 image: Sufi Master Hisham Kabbani speaking on the first day.